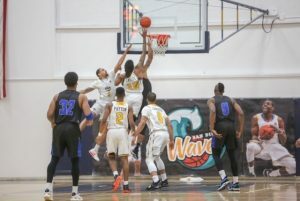 SAY San Diego is pleased to partner with the R.E.A.L. Collective at O’Farrell Charter School’s Family Support Services (FSS). The R.E.A.L. Collective—which stands for Relationships, Education, Agency, and Leadership—aims to support O’Farrell youth with the help of UC San Diego mentors in an after-school peer support group. O’Farrell and UCSD students meet as a group once a week to participate in fun, yet challenging community-building and social-emotional learning activities. The R.E.A.L. Collective is a space for students to express themselves, find community, grow as critical thinkers, and transform into active members of their communities. As a new program to O’Farrell, the first semester of activities placed emphasis on cultivating positive mentor-mentee relationships to allow youth self-expression to flourish. Some of the students’ favorite activities were playing basketball with their mentors, creating experimental slime, and designing ugly Christmas sweaters. In December, the R.E.A.L. Collective had the opportunity to take a field trip to the Birch Aquarium. The students explored the world of marine biology by trying on cold water immersion suits from scientific expeditions. With the guidance of Birch volunteers, the students were able to closely discover marine life, like sea anemones and sea cucumbers, in the aquarium’s tide pools. As the R.E.A.L. Collective transitions into the New Year, UCSD mentors will begin to implement strategies for advancing O’Farrell students’ academic performance, volunteer experiences, and college/career interests. The R.E.A.L. Collective also looks forward to fostering a stronger support network among the students’ families. Every holiday season, SAY receives countless notes from families thanking our Holiday Hopes program supporters. Some of the messages are a mix of drawings and simple words from children just learning to write. Some are from parents struggling to put into words how the kindness of strangers has made a difference. Some are like the note below, written last week by David, a youth who is old enough to understand that his family lives in poverty and wise enough to understand what SAY support means to his family. SAY helps thousands of youth like David every day. Whether it’s a gift for the holidays or support for our work throughout the year, your donations make a difference. Beyond the financial impact of your contribution, your gift is also a reminder to kids like David that they are not alone. If you have already contributed to help people like David and his family, thank you very much for your support. If you are considering an end-of-year gift, please donate to SAY through our Champions for Youth campaign. Farmers Insurance and The Century Club of San Diego will automatically add to your donation. It’s the best way to give to SAY now through January 27, 2019. CLICK HERE to donate to SAY through Champions for Youth. These shoes belong to a wonderful 5-year-old girl named Jessica, who loves to draw and dance. 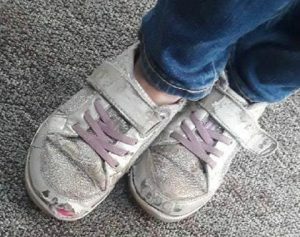 These shoes are the only pair she has worn since school started this fall. Jessica lives with her recently divorced father, who arrives diligently after work every day to pick her up from the SAY after school program. When SAY staff noticed Jessica taking leftover snack-time food home, they began working with the school to offer the father support. 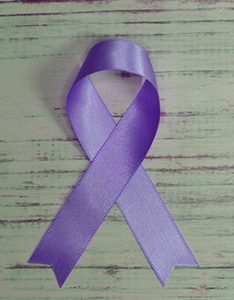 They continually tried to open the door for a conversation, but the father is a man of few words and desperate to provide for his daughter on his own. Last week, the father realized he could not do everything by himself. “I need help,” he said very quietly and simply to the SAY school site leader. He asked for food, shoes, and winter clothing for his daughter. Thanks to the generous supporters of SAY’s Holiday Hopes program, our staff was able to respond immediately. This holiday season, Jessica will have food, clothing, and a new pair of shoes. Although Jessica’s father never asked for toys, SAY’s donors enabled us to give him gift cards to make the holiday season extra special for Jessica this year. He was overcome with emotion when he realized that he would have this opportunity to bring comfort and joy to his daughter. So, as you celebrate the holidays with your loved ones this year, please take a moment to imagine the squeals of joy from little Jessica when her father surprises her with gifts she never expected. Imagine her pulling on her new socks and shoes, donning her new jacket, and dancing outside for everyone to see. And if you’re a parent, I’m sure you’ll be able to picture the tears in her quiet dad’s eyes, too. Thank you very much for making a difference for Jessica and hundreds more just like her. Warm wishes and Happy Holidays from all of us at SAY San Diego! P.S. A gift of $10 can change a person’s world. It provided little Jessica with a new pair of shoes! 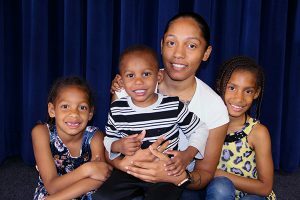 If you are considering a gift to SAY San Diego to help people like Jessica over the holidays and beyond, please donate through our Champions for Youth campaign. Farmers Insurance will add to any gift of $10 or more through this campaign now through January 27, 2019! It’s the best way to donate to SAY and 100% of your charitable gift goes to SAY! By the time he was 16, Jeff was on probation, struggling with a cocaine addiction, and failing at home and school. He was quickly on the path to becoming a statistic – another youth in the San Diego justice system, or worse. His family felt helpless and spent many worrisome nights wondering what bad news they would get next. Fortunately, the court mandated Jeff’s participation in SAY’s Reflections program, where he received the right help and changed the negative course of his life in less than a year. Reflections provided both Jeff and his family with intensive counseling, and private funding from SAY supporters helped Jeff’s family with emergency food and essentials. Individual donations of as little as $10 provided Jeff with shoes and clothing so that he could participate in a confidence-building running club for Reflections youth. About halfway through his enrollment at Reflections, Jeff started to see hope in his future. 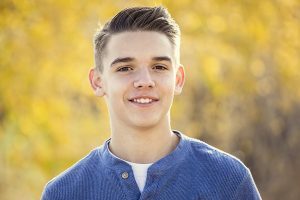 He started asking his counselors how to start the process toward a life of sobriety, and as Jeff committed to additional counseling, other areas of his life started to improve as well. His grades improved and he is on track to receive his high school diploma in June. He was even approved for a school internship, which led to a job. This holiday season, Jeff and his family are filled with hope and focused on the future. Reflections serves an average of 125 youth ages 12-17 annually, with 90% staying out of trouble while in the program. Your gifts to SAY San Diego make a difference. 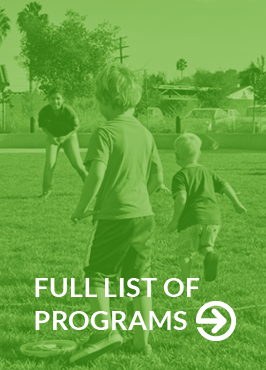 Reflections is one of 30 programs SAY provides to youth, families, and communities every day. Thank you for your support. If you are considering a donation to SAY this holiday season, Farmers Insurance will add to your gift through our Champions for Youth campaign. 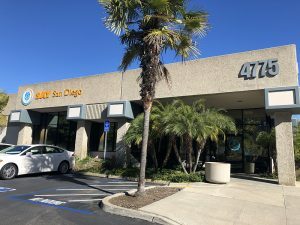 SAY San Diego’s Main Office is Moving! 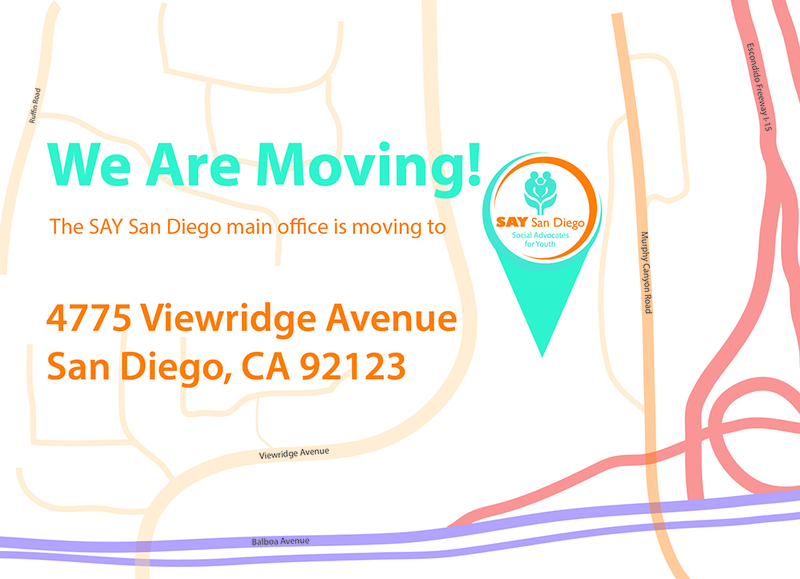 As part of our ongoing commitment to respond to community needs, SAY San Diego is excited to announce that our main office is moving to a new, expanded space in Kearny Mesa. The new site will incorporate a larger community meeting room, more counseling and client spaces, improved work spaces, and a workplace early childhood center for our employees and the community. The early childhood center, which will open in 2019, will serve families with children ages 6 weeks to 5 years. SAY San Diego’s new community, client, and office spaces will open December 3, 2018 at 4775 Viewridge Avenue. We will move all meetings, appointments, and operations from our Aero Drive site to Viewridge Avenue. We look forward to greatly continuing and expanding our mission to partner with youth, families, and communities reach their full potential. 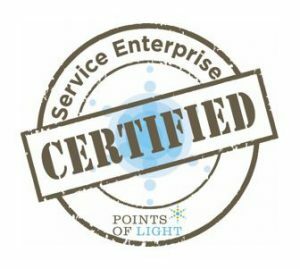 SAY San Diego is pleased to announce that we have been certified as a “Service Enterprise” by Points of Light, the world’s largest organization dedicated to volunteer service. 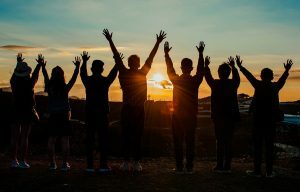 With this certification, SAY joins a prestigious group of nonprofits committed to effectively delivering on their missions by strategically engaging volunteer time and talent. SAY is one of 300 service enterprises nationwide that fundamentally leverage volunteers and their skills throughout their organizations. Through the Service Enterprise Initiative, SAY San Diego participated in a comprehensive research-based assessment, training, consulting and certification program. SAY completed the wide-ranging assessment, over 20 hours of training and consulting, and extensive internal planning to better integrate volunteers in our day-to-day operations. By achieving this level of excellence and certification, SAY San Diego is now better equipped to leverage the skills of volunteers. Now SAY is in the top 11 percent of organizations in the country in the area of volunteer management and organizational performance. Research conducted by the TCC Group, a national program and evaluation firm, found that organizations operating as Service Enterprises outperform peer organizations on all aspects of organizational effectiveness and are more adaptable, sustainable, and capable of scaling their work.